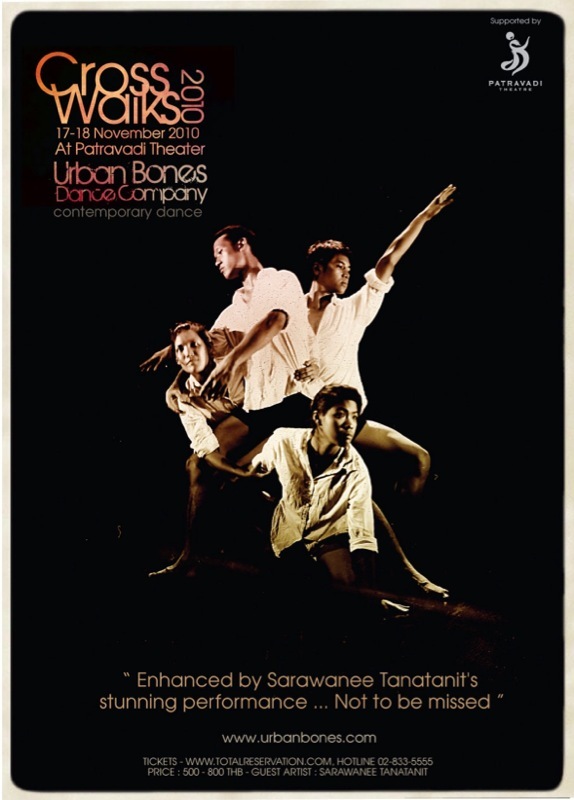 Urban Bones Dance Company (UBDC), a young contemporary dance company based in Bangkok, will present its newest work “Crosswalks”, at Patravadi Theatre on November 17 th and 18th, 2010. Composed of three very different sections loosely inspired by the work of renowned American writer Paul Auster, “Crosswalks” explores questions of identity, space, language and literature through the use of movement, time and space, creating a distinctive postmodern ( and critique of postmodernism) form in the process. A true expression of our world, where it is so easy to get lost in the running, it reflects what can happen when someone stops and reflects. On stage throughout, this encounter is reflected by emotion made movement and music. Music and dance reflect fragility, strength, at times vulnerability. Movements are deep, powerful and fluid, fast and slow. There is no dance moment that stands out particularly, no combination of movements that makes the audience gasp at its ingenuity. Every step and gesture becomes inevitable, a pure essence of expression that makes each dancer and emotion as large and vivid as life — and death — itself. Set to music by Phillip Glass, this new choreography by UBDC is set in the city, with streets intertwining in a square pattern, the lack of horizons, the flow of cars, people walking by, trying to get somewhere, molecular tissue with no specific directions but the ones that every individual wants to imprint to his own paths, sometimes continuous and sometimes broken. In the middle of this apparent confusion, things happen: encounters, meetings, separations. Artistic director of UBDC and choreographer of “Crosswalks”, Phillip Saint-Paul has worked with many noted choreographers in the past such as Trisha Brown, Lance Gries and Demetrius Klein as a performer before calling Bangkok his home. By creating “Crosswalks” he aims to fill the void of original contemporary dance in Bangkok. Joining hands with Saint-Paul in “Crosswalks” is Sarawanee Tanatanit, Thailand’s own dance jewel, former member of American Ballet Theatre and currently dancing with Grand Theatre Ballet de Geneva in Switzerland. Cecily Chow, the lighting designer and technical director of the production will bring her professional experience from San Francisco to benefit the production. With artists from Thailand, France, United States, Japan and the Philippines, “Crosswalks” is truly a cross-cultural collaboration. hotline 02-833-5555 to book the tickets.